We had been asked quite a few times for a great yarn for those special projects, flouncy shawls and beautiful scarves. After careful thought we found there are a few hand dye companies that offer boucles in various mixes, but nothing to justify the time and effort that our customers put into the work to create that extra special garment. Ivy Brambles is pleased to release "Rodure Silk Boucle", a 100% silk boucle that is just total luxury. Available in our semi-solid colorways and a few selected variagated colorways. The yarn is designed to be used in place of simpler yarns to allow those relatively easy projects to produce results as spectacular as a more time consuming lace project. 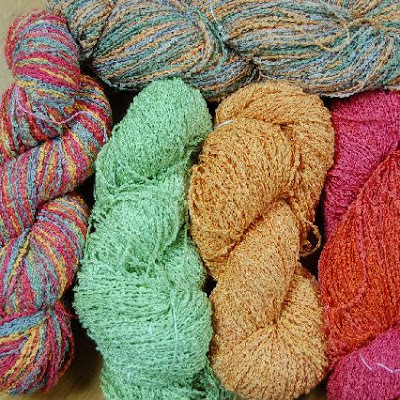 Each 3.5 oz skein is 310 yards, enough for most one skein projects, and is reasonably priced at $56 SRP. Available from selected retailers.